Something special is coming up on Sunday – it’s so special it’s “to die for,” and luckily there are a few tickets left, so grab them quick. 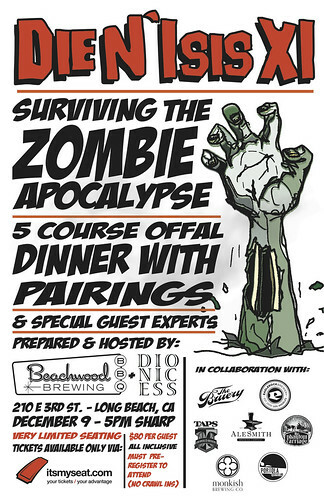 Yet again, there’s something brewing down in Long Beach – but for this 11th installment of Dionicess, you can forget it being holiday themed, and instead Walking Dead themed. Zombie themed. What-have-you. To match, the series has been temporarily renamed as “Die”-nisis and will be serving food to accommodate their vision, including food and beer inspired by corpses, skeletons, brains and all of the above. Though they say it’s a 5-course dinner, if you’re familiar at all with their events, you know there will be some extras. Bonus: You’ll get to hear intriguing speakers (a pharmacologist, an expert in forensics and a neuroscientist amongst others). They will guide guests through what they might expect in a zombie apocalypse, and how best to prepare themselves when one occurs. I mean, if it occurs – in which case you will certainly survive much longer than others who will not have heard their tips. 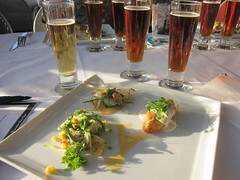 This entry was posted in beer, charity, Events, Food, Long Beach, Pairings and tagged Beachwood BBQ, beer, Dave Watrous, Dinner, Eagle Rock Brewery, Gabe Gordon, Gev Kazanchyan, Long Beach, Monkish Brewing Company, pairings, Phantom Carriage Brewery, Portola Coffee Lab, Randy Clemens, TAPS Fish House & Brewery, The Bruery. Bookmark the permalink.